Do you have multiple Google accounts? Would you like a way to easily switch between your Henrico Google Account and your personal Gmail Account? Maybe a significant other uses your computer and you would like for them to be able to easily log into their Chrome account. Creating user profiles in Chrome makes this possible. For example, I have 4 Google Accounts: Henrico, Personal Gmail, Huskie Podcast, and a Test Student account. Adding these 4 profiles to Google Chrome allows me to easily switch between the different accounts. Whenever I switch users, all of the apps, extensions, and bookmarks associated with those specific accounts become active with just a few clicks. Chrome recently changed the look a feel of user profile switching. Check out the changes below. 2. Choose an Avatar and name the account. 4. Repeat the process to set up more user profiles. 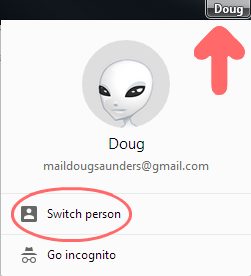 Once the user profiles are set up you can switch between those profiles by clicking on the profile name in the upper right hand corner of the Chrome browser. By clicking on the profile name you will be able to select "Switch person" or "Go incognito". If I wanted to quickly switch from my personal Gmail account to my Henrico account I would click on the switch person link. This will open a new parent window that gives me the option to select my Henrico Google Apps Account. After clicking on the Henrico Ninja account, a new browser window opens with me signed into my work account. Now any website I visit will have me signed in with Henrico credentials. My personal Gmail account will continue to run in the background and will remain open until I decide to close that browser window. You will also notice that you can select the "Browse as Guest" option. This is helpful if someone is using Chrome on your computer and you do not want them having access to your search history, bookmarks, or having them surf the internet while logged in with your account information.